Updated after 9/2017 NPHS PTSA meeting. We think school scheduling can work harder for New Providence High School (NPHS). Enrollment and state requirements have increased. Scheduling became more challenging. As a result, enrollment in non-core subjects like music declined. Our community rose to the challenge by adjusting our strategic plan, updating curriculum and passing a bond for construction. In case you missed the first NPHS PTSA meeting, that’s where parent discussions of scheduling will be happening this year, led by NPHS Principal Lauren Zirpoli. She’s set up a faculty committee to evaluate and recommend scheduling options and distributed a parent survey. To encourage a well-researched discussion of the issues we have written this blog post. We show how one alternative schedule could better meet NPHS’s needs. It is based on the research of 3 parents, Malathi Narayan, Donna Zane and Cecile Seth. We eagerly support the faculty’s collaborative process to find the best scheduling solution for NPHS community! A rotating drop schedule takes the best of a period schedule and the 1990s block schedule and forms a hybrid. In rotating drop schedule the kids meet for longer periods but don’t have every class on every day. By spending less time changing classes, students can take one more academic class. This brings high school students from 7 to 8 academic classes like middle school scheduling. In fact, many comparable school districts have already made these changes. Below we highlight the benefits and challenges. Teenagers should explore new subjects in their electives and after school clubs. Exploring new subjects helps our kids figure out what they want to do in college and their careers. Financial, economic, business or entrepreneurial literacy – 1 semester, not shown below. This chart drives the crowded schedule home. In 9th – 11th grades, students in regular science choose one elective each year. Honors science students get 0.5 electives unless they start school at 7:10 (zeroth period). Then they get 1.5 electives. Honors science high school students who choose not to take zero period lose another half an elective each year. This would leave them with a total of one “free” elective in high school. Finally, kids with IEP’s or 504 plans often need to take a particular section of several subjects. This can also keep them from continuing with a beloved music ensemble. Adding an 8th period gives students 1 more elective each high school year. A student on the college preparatory track would have 7 “free” (discretionary) electives. In contrast she would have 3 now. A student taking 4 years of honors science could choose 4 free electives. Orchestra, voice, concert band, ensembles, music theory. Students have juggled many musical interests through middle school..
Graphic design, sculpture, drama, AP Government, AP Literature and much more. STEM, Project Lead the Way, computer science, Biomedical or Aerospace Engineering. a study hall, like in middle school. Math, language arts, science and social studies, have been consistent from elementary school. In middle school, students had the option of band, orchestra, ensembles and a chorus lesson. Students don’t want to be forced to drop an instrument (or a language) they’ve worked hard to master just because of scheduling issues. 5. Build on historic strengths in music, science, math and the arts. With so many great classes, kids need 8 academic periods to fit them in! An 8th period helps music and arts programs continue to thrive at other schools in spite of the new requirements. 6. Recognize adolescents need more sleep than younger kids. Busy kids juggling music, athletics and clubs might have activities end at 10 or 11 pm. They are due back in school at 7:10 am for zero period gym. In season athletes can take a sports study hall, but are still required to report at 7:10 am. Kids then get tardies. If they miss too many then they are in danger of not graduating per state requirements. With a rotating drop schedule, motivated high schoolers won’t have to show up almost an hour earlier to fit in all their desired electives. Despite the headaches, zero period has been a very valuable option overall. Since only 6 of 8 classes meet each day, students have two days to finish their homework for two classes. This is tremendous on those nights with a big game, performance or extra-curricula activity. Many find it harder to focus at a particular time. For example, the first and last period of the day or after lunch. With drop block scheduling, one subject is not always suffering. The same class isn’t meeting at the same time every day. New Providence previously piloted this by giving 7th graders more Language Arts time several days a week at the expense of Spanish. The desired improvements in Language Arts scores were a result. Kids waste less of precious instructional time settling in and packing up. As a result, more of the instructional time is available to learn. It is easier for the administration to adjust for holidays, snow days, or a sudden water main break. If students have to leave early for a competition, the same subject won’t always suffer. The end of the high school day should enable sports teams to arrive at events in a timely fashion. Constraints still include cafeteria space, classrooms, staffing, contracts, and extracurricular activity schedules. A “common lab/lunch” theme is used by many neighbors in their high school scheduling. Honors science could continue to encroach on an adjacent period twice a week for extra time for lab work. Currently this is often a music ensemble. We now have 5 lunch periods across the middle and high schools. An administrator wisely encouraged parents to focus on “what” we would like to see and let them concentrate on the “how”. Faculty would also need to adjust lesson plans for the longer class periods. Without these advantages, our students and district will lose our competitive edge. Luckily, New Providence School District has a track record of implementing big changes well. Rotating drop schedule with 8 periods. This is our preferred option. Most classes in a rotating drop schedule are about an hour. Our local comparable peer high schools have all moved to rotating drop block except Millburn and New Providence. Alignment of MS/ HS classes to form the same 8 academic periods every day. The block scheduling of the 1990s (4-90 minutes classes). There are many other options and variants. New York City schools have a great overview, A Brief Overview of Scheduling Options. To add back time for electives, many surrounding schools offer 8 courses by using a 4-day, rotating drop schedule. Locally, Millburn and New Providence are the exceptions. We’ve summarized their bell schedules below. Let’s learn from their examples. Governor Livingston High School – Overview. 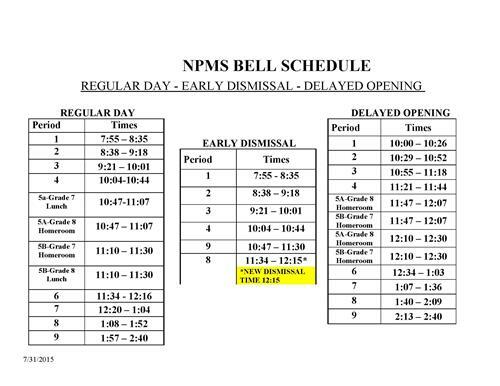 Daily bell schedule on page 39 of their student handbook. Chatham High School – Overview and daily bell schedule. Madison High School – published a great FAQ on why they switched. The NJ.gov describes them in a great overview on page 8. Northern Valley Regional High School (Bergen County, NJ) – Overview and daily bell schedule start on page 10 of student handbook. Their high school’s 4 year academic framework gives a useful overview of NJDOE’s graduation requirements. At first, NVRHS had some science labs take up two adjacent blocks. But this gave Sophomores and Juniors only one elective. This hurt enrollment in music and the arts. In 2016-17 school year they moved to a popular variation. Science labs are part of a common lunch block. This enables all core and electives to have equal importance. Paramus Regional High School – Bell schedule and overview are on pages 2-3 of their student handbook. Like New Providence, Paramus has a strong music program, a tradition of pull out music lessons and two lunch periods. Hence they are a helpful example. Summit High School – Monday through Thursday Summit’s block schedule resembles the schools above, with 6 classes meeting 4 days a week. All 8 classes meet on Friday. Each day of the week has a different schedule: A, B, C, D and E, which can be found on pages 8-11 of their student handbook. This 5 day schedule bears further investigation. It also might help share teachers between elementary and upper schools. Union County Vocational Technical Academies – See page 8 of UCVTS’s handbook. Their bell schedule terminology uses academic blocks and periods. This might help delineate our middle and high school lunch periods. Millburn High School – only 7 academic periods meeting each day for 43 minutes according to their bell schedule. New Providence High School – 7 or 8 academic periods each day meeting for 42 minutes (zeroth period), 44 minutes (morning) or 46 minutes (afternoon). Our middle school and high school share a facility. In the afternoons they are on the same schedule. This benefits both schools because they can share teachers, classrooms and the cafeteria. When the building is full, school scheduling is challenging. The district forecasts enrollment increasing annually in the NPMS/NPHS for the next 5 years. Luckily, our residents and school district passed our school bond in September 2016, to be completed in Fall 2017 (now). Newly constructed laboratories and classrooms should also help scheduling. As a result, we will have the most flexibility to experiment with schedules in the 2017-2018 year. Most of our high school students start at 8:05 a.m., have 7 academic periods and end at 2:40 p.m.
For some high schoolers, there is a 7:10 a.m. section of gym. This zeroth period enables those enrolled to take 8 academic classes. Recently this has only been available to honors science students. Their science class scheduling requires an extra half period for lab. In 2017-2018 zero period expanded to include music ensemble students with scheduling difficulties. Rotating drop would provide more scheduling flexibility. Each period could include many options, including gym. Currently, our middle school students start at 7:55 and have 8 class periods a day. Middle school has 8 academic periods: 6 core classes, 1 mod and 1 period of music or study hall. These “Mods” are a wonderful introduction to a variety of topics that will be available in high school. Each lasts about 6 weeks and explores a new subject. They have helped many a student discover and explore a new passion! Luckily, New Providence rises to the challenge! Just to reiterate, this is the research of 3 parents at the beginning of the process, not a final recommendation. NPHS PTSA meetings will be used to gather input from all interested parents about many different scheduling options and concerns. The faculty scheduling committee and Mrs. Zirpoli will drive the effort. Here is how the process might look. During the 2017-18 school year New Providence High School will assess options for scheduling the school day, including forms of block schedules. NPHS will survey parent opinions. A faculty committee will assess the options and visit local schools. After the first marketing period high school students will try the most likely new schedule for a cycle (about a week). Then NPHS will again solicit student, faculty and parent opinions. If necessary, the high school could try a second type of new schedule for a cycle. Afterwards, stakeholders would be surveyed again and an option chosen. Class selection would be moved from November to January so students know if they have 7 or 8 classes to select. The new schedule’s earliest expected implementation is September of the 2018-2019 school year. Conveniently, the once in 3 year update of teacher and district contracts, falls in Summer of 2018. While this is a possible scenario, NPHS Principal Mrs. Zirpoli will manage and communicate specifics. We would love to hear your ideas too! What do you think? NPHS PTSA meetings are the place to be this year!